Recent evidence on malnutrition and poverty raise important questions on the role of food assistance policies and programs. 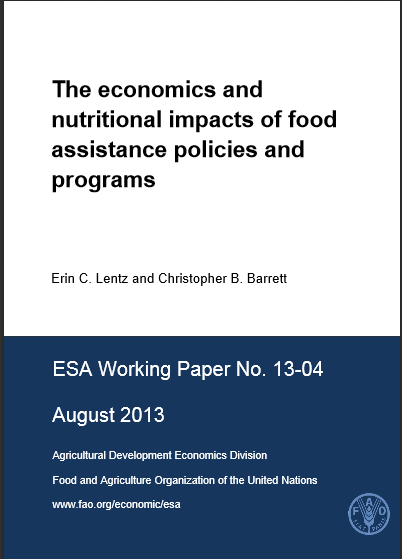 In this review article, we examine evidence on the economic and nutritional impacts of international food assistance programs (FAPs) and policies. The returns on investments in FAPs are, on average, high but depend considerably on the targeting and cost structures as well as on food quality and role of complementary activities. We disaggregate findings into four classes of recipients. Returns to FAPs are highest for children under two. But, FAPs oriented towards early childhood interventions are less well funded than are interventions aimed at school-age children or at the broader, largely adult population even though available evidence indicates that these latter classes of interventions offer considerably lower average returns in economic, health, and nutrition terms. Nonetheless, FAP effectiveness in achieving any of several objectives varies with a range of key factors, including targeting, additionality, seasonality, timeliness, incentive effects, social acceptability and political economy considerations.